I was raised on stories of the Clyde boats such as the Rockabill or the Tuskar. It wasn't just because they passed the house on a regular basis, but they were major employers in the area, and were vital when it came to the export of cattle and other goods. 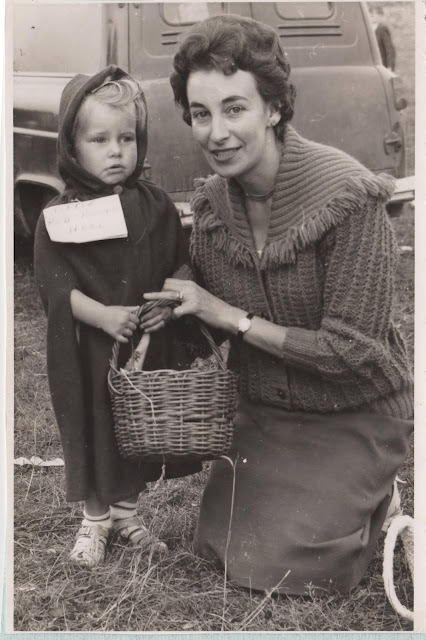 We can't ignore that there was also the connection to emigration and the loss that was felt when people went away, or the joy they felt on return, whether holiday or for longer. My father tended to take either of these ships as they sailed to Liverpool, where he was based sailing on English ships. My mother of course was more familiar with the Great Western. 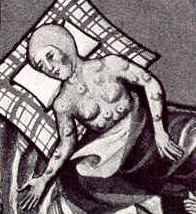 a rival company, that sailed to Fishguard and hence, for her at least, London. 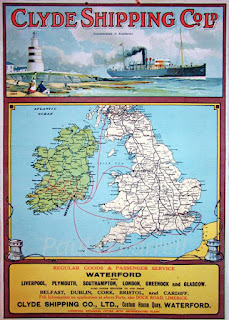 Regular Weekly Service between Cork, Skibereen, Schull, Bantry, Castletown-Berhaven, Valencia, Cahirciveen, Dingle &c., &c., by the Steamers "Rockabill" and "Fastnet". For particulars of Sailings see separate Bills. The Cheapest Route for Goods to and from the above Ports and Towns adjacent thereto. or other First-class Vessels, are intended to sail without Pilots, and with liberty to tow vessels and to call at any Port or Ports in any order in or out of the customary course, to Receive and Discharge Cargo, or for any other purpose whatsoever. MONDAYS, 2nd, 23rd, and 30th December. WEDNESDAYS, 11th and 18th December. Cork to Dublin ... 10s ... 15s ... 5s? Cork to Belfast ... 17s 6d ... --- ... ? Cork to Glasgow ... 17s 6d ... 25s .... ? 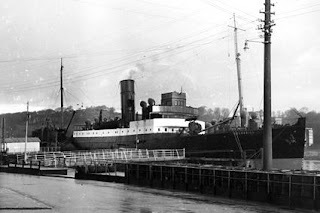 Note.- The Clyde Shipping Co. insure all goods shipped by this Line of Steamers at 3s 4d per (cont.?) to Traders having yearly agreements, and 5s, per (cont?) to occasional shippers. Values to be declared at time of shipment. Forms and information to be had at the offices. The above gives some sense of scale to the operation. On the list of ships it was noteworthy that the two ships most closely recognised with Waterford, the Coningbeg and Formby did not feature. Their dual loss in 1917 would rock the city and harbour. I was interested to note that the company had the right to sail without pilotage into and out of ports, normally a good revenue for the port, and one that would not be lightly waived. Also intrigued to see how prevalent it was for steam ships to offer towing facilities. Obviously the golden age of sail was coming to an end, but the need for becalmed sailing ships to get to port or sea was a lucrative business. Perhaps the most interesting point I found was the willingness to call to any port to discharge or take cargo. 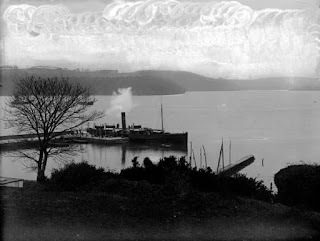 It might explain why a ship of coasting size was at Cheekpoint in the photo below. It was also interesting to see so many familiar ships names in this very old notice. Needless to say, the Rockabill mentioned in the ad was a different vessel. From the 1860s, there was a tradition of naming ships in the company after lighthouses, or lightships. 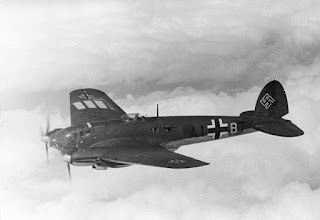 In all 32 names were used, some on up to five different vessels(3). As can be seen the Waterford company offices were located on Customs House Quay. The offices finally closed in 1967 and I believe the last sailing of a Clyde boat from the city, at least under the company flag was Rockabill in 1968 (but I'm happy to be corrected on this point). Ending a very proud tradition indeed. * Some parts of the paper were difficult to read, if not illegible. I've added a ? where I was unsure of the text, and left it blank where I was totally unsure. (1) McElwee. 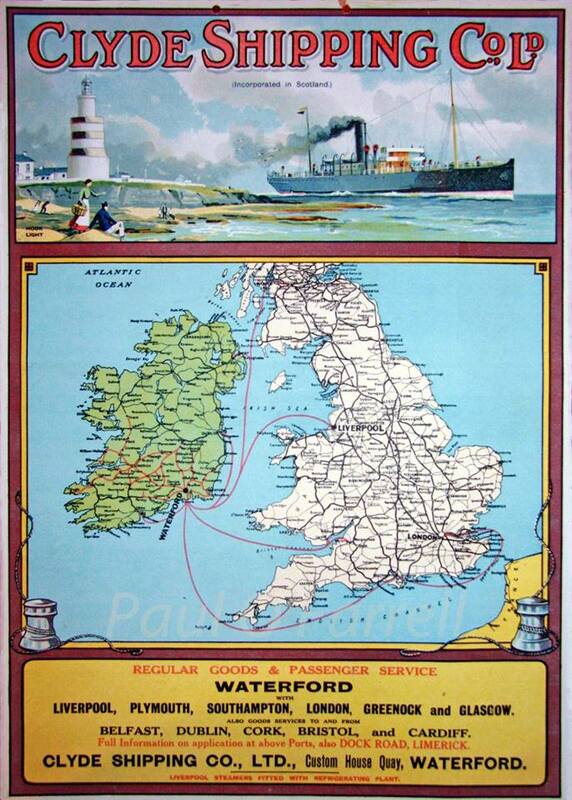 R. The Last Voyage of the Waterford Steamers. Well done Andrew. I love reading your posts to get a better understanding of my heritage and the history of Waterford. Thank you!